TG3 is a New Mexico-based reeds-brass-drums trio playing avant chamber jazz full of tight hairpin turns between arranged structures and spontaneous combustion. Remastered and reissued from out-of-print 1996 edition on PostOut. 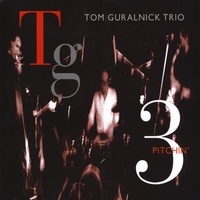 Eleven miniatures by the Tom Guralnick Trio/TG3, featuring Tom Guralnick (soprano/alto/tenor saxophones/compositions), Steve Feld (tenor/bass trombones, bass trumpet, euphonium), and Jefferson Voorhees (drums/talking drum), active in New Mexico and beyond 1990-2000. Originally recorded in 1996, and new remastered and reissued, the eleven pieces, composed by Guralnick and collectively arranged by the trio explore boundaries between traditional and contemporary avant-garde jazz, between world musics (particularly African and Indian influences), and experimental/extended technique improvisation, with equal focus on solos, collective interplay and and duo and trio interactions. CODA calls TG3 "a band, roots in tout de suite, joined at the hipness." OPTION calls them "...one of our best small jazz groups in the Southwest...whether they groove, grin or grumble, this is one top-notch band"
CADENCE praises the performances on TG3 PITCHIN' for their "tight lyricism and intimate group dynamics," and 5/4 MAGAZINE adds: "Rich in counterpoint and long on playful exuberance, they mold music that parlays call and response into post-modern chamber jazz...While configured for open space and expression, it is the well conceived theme development that gives TG3 definition and accessibility...With melodies from folk to N'Orleans blues to 12-tone suspension, Pitchin' makes a case for how far ranging the melodic content of jazz remains..."
Of the individual performers CADENCE says: "Whether on gruff-toned tenor, clean, singing alto, or snaking soprano, Guralnick digs into the music with a bouyant spirit and bristling energy. The low horns provide the perfect foil, either doubling the sax lines, picking up snippets of Guralnick's phrases and firing off shrewd counterpoint, or laying down a fat bass groove. Feld is also an able soloist in his own right, combining limber slide work with gritty growls and smears. Voorhees has played in both dance bands and West African ensembles and it shows in his ability to swing even the most idiosyncratic of meters and phrasings." 5/4 MAGAZINE adds: "With the wide voicings of Feld's euphonium, bass trumpet, and trombone, and Guralnick's carefully pitched reeds, TG3 covers more tonal and harmonic range than might be expected from a cursory look at the lineup. Feld locks up impressively with Voorhees' African, by way of Ed Blackwell, approach to the traps, giving the trio a definitive bottom that shifts smartly from swing time to march to no time." VILLAGE VOICE says: "Music this deep and well played is almost scary, a rare match of technique and passion." After 10 years TG3 stopped performing and touring in 2000; Guralnick is Executive Director of the Outpost Performance Space in Albuquerque; Feld is Professor of Anthropology and Music at University of New Mexico; Voorhees is active in numerous jazz, popular, world music, and experimental groups in New Mexico.